Resurrection means life! Join us in joyous celebration of the fullness of life that comes with Jesus’ victory over death. We sing and celebrate Jesus’ resurrection and victory as our moment of liberation. 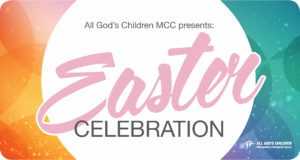 Come experience with All God’s Children the liberating power of Easter!